BatteryMINDer Model 483CEC1: The most advanced series of Battery Charger-Maintainer-Desulfators that BatteryMINDer has every offered using SmarTECHnology™. Users can now determine the level of charge remaining in their battery, and if weak and in need of replacement, before going bad. In addition, units test for weak cells and will recover weak or severely discharged batteries that other chargers would reject. 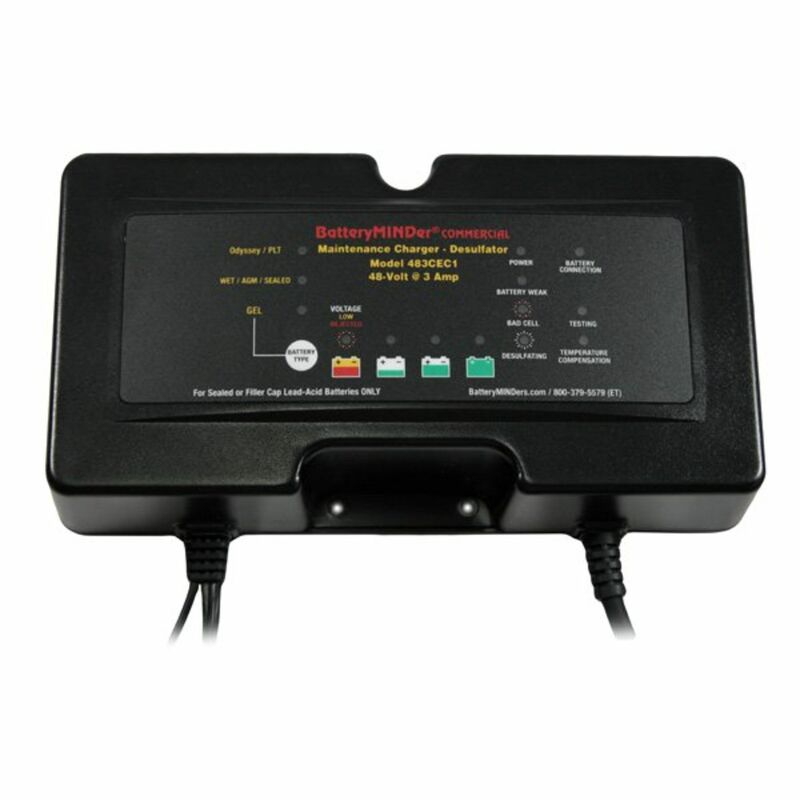 The Battery MINDer is a 5-stage charger/maintainer/desulfator-conditioner that extends performance and life of all types of 48 Volt lead acid batteries. These include Sealed, Wet (filler cap), Maintenance-Free, AGM, Gel, PLT, Odyssey batteries. Each Battery MINDer ships with a ring set and an EZ Connector & Mounting Screws. User can select battery type for ALL lead-acid based batteries. Maximizes battery life and performance. Detects battery with weak or dead cell. Sensor prevents over/under charge over wide environmental temperature range. For Sealed, Wet (filler cap), Maintenance-Free, AGM, Gel, PLT, Odyssey. Automatic HF desulfation pulses to dissolve harmful sulfate. 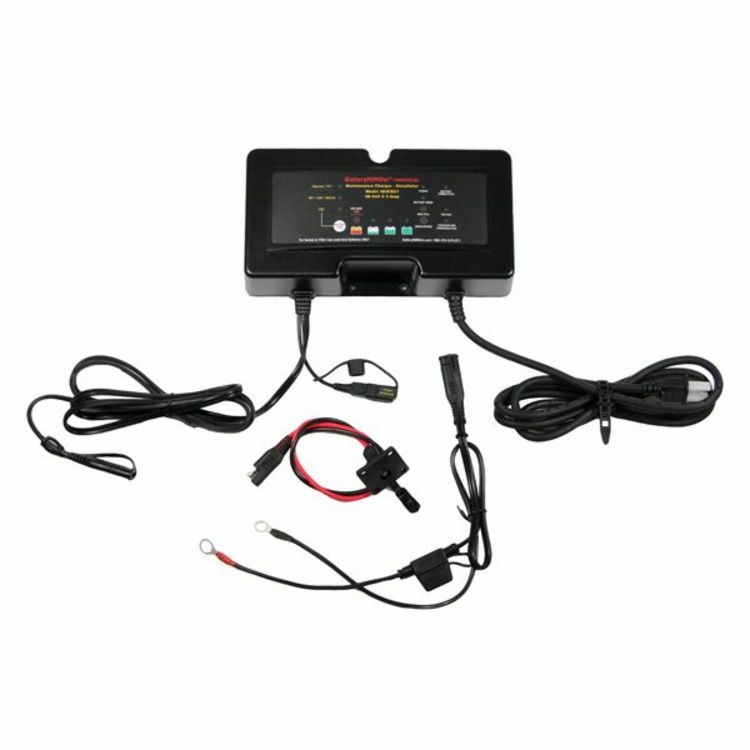 Maintains up to six (6) batteries at a time (requires BatteryMINDer "Y" connector assemblies model 210AY). Multiple LED Indicators show state-of-charge and condition of battery. Intrusion Protected from water & dust (Certified to International Standard IEC IP65). Short circuit, spark, polarity and thermal run-away protected. Extremely low cost of operation. Not Designed to replace original higher Amp chargers. Use to maintain and desulfate batteries AFTER being fully charged with conventional charger. This will prevent premature failure of unit due to overwork. The BatteryMINDer automatically dissolves power-robbing sulphation crystals using safe, low voltage, high frequency U.S. Patented pulse technology. Do you own the 483CEC1? Please, tell us what you think about it. It helps us provide you with better products. Please note that it may take up to 72 hours for your review to appear.